Two years ago when I was getting started with PIC Micros I wrote a tutorial on how to drive the LCD display of the PIC18 explorer board using some code that I had found online, now that I am far more comfortable with the SPI protocol and PICs I have rewritten that tutorial here but with my own code this time. This version is much shorter, understandable, and portable because it uses the MC18’s compiler SPI library, enjoy. Am going to begin this tutorial by first giving you all the code you need, I will explain each line below. Before you upload this code to your board please note that it was tested on the C18 compiler version 3.44, this code does not work on version 3.45 as of 01/25/2013, the compiler says that one of the SPI’s library functions is not defined which after hours of analyzing include files I believe it’s a bug on Microchip’s part. Before we move to the software it’s very important that you understand the hardware. I have cut out the connections between the PIC18F8722, the MCP23S17 SPI I/O expander, and the LCD display from the board’s schematic page, they are below for your convenience. The MCP23S17 is an input/output expander chip, this just means that with this chip you are able to add more input or output pins to your circuits and because it uses the SPI protocol you are able to control them with very few pins. In the case of the MCP23S17 you are able to control 16 pins for input or output with only 4 pins from your PIC. However, the LCD only requires 10 pins: 8 for the data ( D0 to D07) and the enable (E), and register select (RS) pins. In order to control the MCP23S17 you first have to specify if you want to write to or read from it. We will just be writing to it, the next step once you have selected the write command is to select the register you want to write to by sending the I/O expander chip the register’s address. Lastly, you send the value you want to give to that register. This is how we’ll modify the contents of the GPIO register. The code in both functions setIODIR and setGPIO is actually the same, I just thought it would be best to creat meaning full names. You can even use either function to modify the contents of other registers listed in the datasheet. All the MCP23S17’s register’s are shown in the figure below. 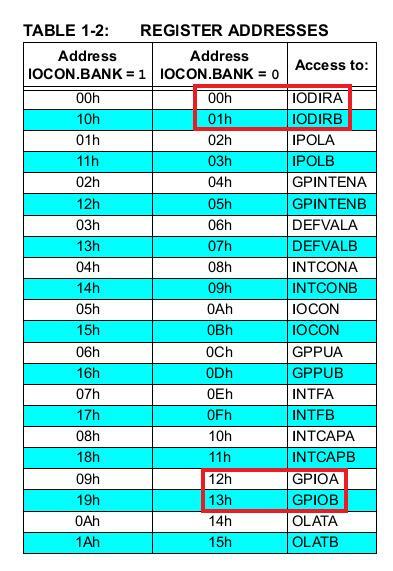 We will only be working with the IODIRB, IODIRA, GPIOA, and GPIOB registers. The IODIR register’s are used to set the direction of the GPIO pins (input or output) and GPIO registers are used to set the value of the pins (On or Off), think of then as TRIS and PORT respectively. Am going to create a few constants from the table for the registers’ address am going to be using so that my code makes more sense. Very simply: LCD displays take either commands or data to display. Each time you send a command or data you need to toggle the enable pin (E) to confirm. To send a command to the display you pull the RS line to 0 and send the respective command bits (listed in the datasheet). Commands include clearing the screen, positioning the cursor, and how cursor behaves. This is the function I made to send commands to the LCD. The delay times are actually arbitrary, they just have to be “large enough” for the chip to detect the change in the value of the pins. To send a character to be displayed you pull the RS line to 1 and follow with the ASCII number of the character you want to show, you can also just send a char type and not worry about having to know the ASCII number. 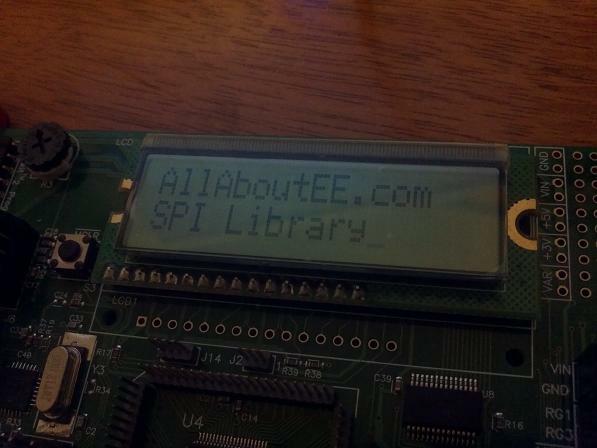 This is the function I made to send display characters to the LCD. Notice that this is the same as the previous function except that this time the RS bit, which is bit 7, is now equal to 1. Either way, I will explain what goes on with the LCD but if there is something you don’t understand refer to this link. Here is also a list of the LCD command you can use. This is the part that seems to confuse everyone that has had problems working with the display in the PIC18 board. Am going to summarize the SPI protocol for you. The SPI protocol consists of 4 pins SCK (clock), CS (chip select), Master-Out-Slave-In (MOSI) or simply data out, Master-In-Slave-Out (MISO) or simply data in. Send the data: this includes the commands i.e. 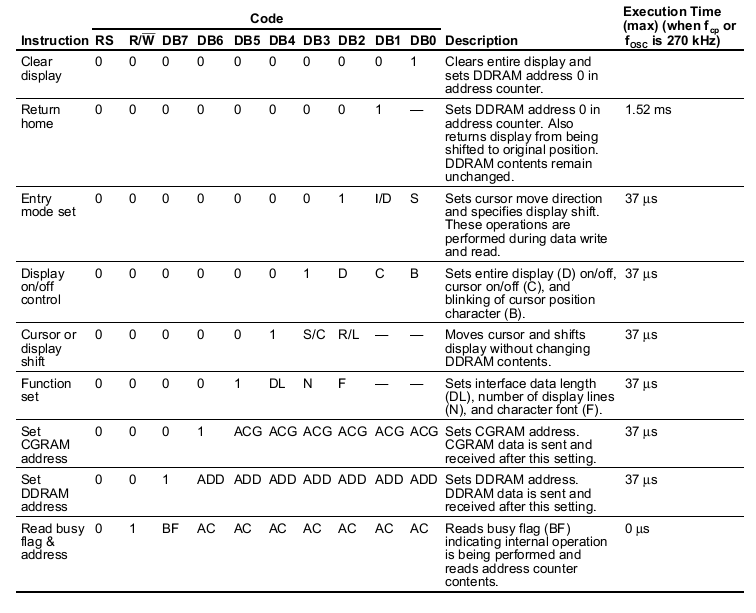 read or write, as well as the register address and its value in the case of the I/O expander. Q: Why do SPI library functions all end with a “1”? 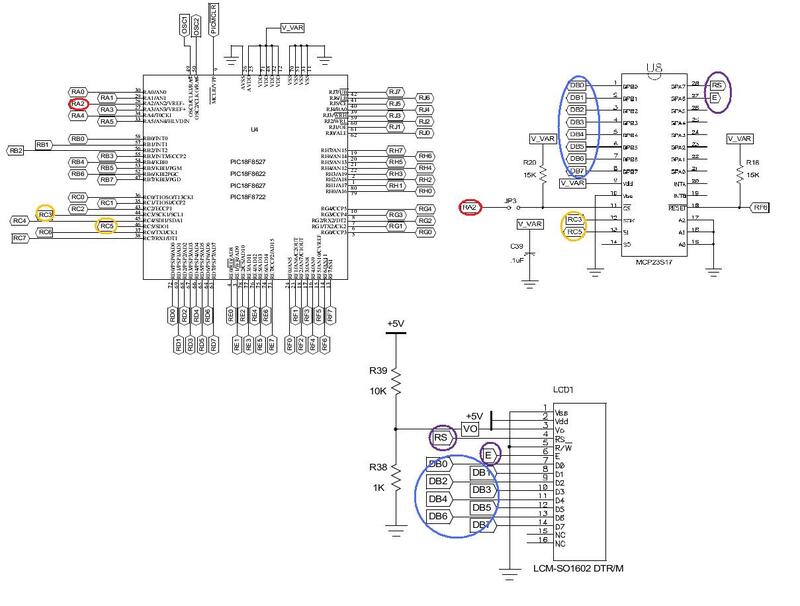 Ans: Because the pic18f8722 chip has two SPI ports, we are using SPI1 because the pins of SPI port 1 are the ones that are connected to the MCP23S17 chip. Note: some chips do not have two SPI ports, in that case you can leave the “1” out of the function’s name, in fact leaving the “1” works in either case because there is a #define which replaces OpenSPI with OpenSPI1 for example.